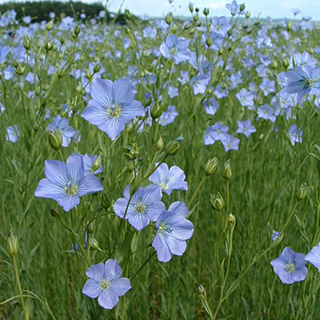 Grown as a food crop in temperate climates, linseed, or flax, is a valuable and readily available dietary supplement. A rich source of protein and omega-3 oils, linseed also contains high levels of phytoestrogens. This is roughly 10 times more than other seeds, making it a key remedy for menopause. 1–2 tablespoons a day, with plenty of water. The a-linoleic acid and omega-3 oil content in the seed is similar to fish oils, although less biologically available. High levels of phytoestrogens make linseed a useful supplement for menopausal symptoms such as hot flashes and headache. An excellent bulk laxative, linseed is a safe and frequently effective remedy for chronic constipation. Soak 1 tablespoonful of seed in at least 5 times its volume of warm water. Leave for a few hours, then swallow, preferably drinking additional water. Flax can be started indoors, and then transplanted out later or just sown directly into the garden. If you have a short growing season, you may want to start your seeds inside so your plants can mature and go to seed before the frost. In small peat pots, plant seeds 5 weeks before your expected last frost date. Keep them in a sunny place and water often enough that the soil does not dry out. They take a while to germinate, so be patient. Your seeds are ready to harvest when the large seed pods are yellow and starting to split open. Cut the pods from the plants, and spread them out somewhere where they can dry further.